Giving students a boost in Early Learning skills! 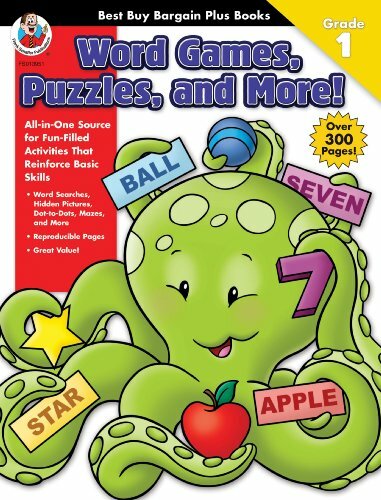 Best Buy Bargain Books: Word Games, Puzzles, and More!, Grade 1 features fun-filled activities that reinforce essential early learning skills! In this must have 320 page book children will enjoy completing activities, including word searches, hidden pictures, dot-to-dots, and mazes, while reinforcing alphabet skills, letter recognition, numbers and counting, colors, shapes, and other important concepts at the same time! Children will enjoy completing these motivating activities that include easy-to-understand directions and a complete answer key. Features: ~ Reproducible activities ~ Activity pages can be used individually or as part of a unit ~ Answer key Truly a best buy! Our best-selling Best Buy Bargain Books series features over 35 grade-appropriate titles covering key subjects including social studies, phonics, science, math, and critical thinking. Each title helps students learn and reinforce important skills needed in the classroom! Recommended by parents and teachers everywhere to help children build confidence and develop the skills needed to succeed! Collect all the titles in this best-selling must have series.